Found in nuclear fuel and nuclear weapons, plutonium is an incredibly complex element that has far-ranging energy, security, and environmental effects. To understand plutonium, scientists at Pacific Northwest National Laboratory and Washington State University delved into a plutonium compound with a relatively simple composition: plutonium tetrafluoride (PuF4). While the formula is simple, the four bonds proved to be more complex. The electrons stay relatively close to each atom, creating ionic bonds -- not the expected electron-sharing covalent bonds. Even though the plutonium and fluorine atoms are tied together in a lattice, they act as isolated atoms and form ionic bonds. "Bonding is one of the big questions for plutonium and its actinide neighbors on the Periodic Chart," said Dr. Herman Cho at PNNL, who led the research. "Answering this question is of huge importance because plutonium's chemistry depends on how it bonds. PuF4 leans toward electrostatic attraction. This work provides a clearer picture of why that is." Why It Matters: Plutonium is formidably complex because of the large cloud of electrons that surrounds its nucleus. It doesn't always act as expected. Adding to the complexity of the element is the limited number of institutions that can safely handle and study the radioactive element. The team's research sheds new light on plutonium's true nature. It could provide insights about key molecules involved in nuclear power, national security, and environmental cleanup. "Plutonium doesn't fit within the simple pictures that apply to lighter elements," said Cho. "This work answers tough questions as to why plutonium acts the way it does." Methods: The researchers began with highly radioactive PuF4 from the long-shuttered Plutonium Finishing Plant in Washington State. At the plant, scientists created hockey-puck sized "buttons" of plutonium. They analyzed the plutonium using nuclear magnetic resonance spectroscopy (NMR), which elucidates key features of electronic structure near plutonium centers. The instruments reside in the Radiochemical Processing Laboratory at PNNL and the Rad Annex of the U.S. Department of Energy's EMSL, a national scientific user facility. The labs are two of the few in the world that can perform NMR measurements on plutonium-containing solids. Cho and his colleagues examined the atoms in the PuF4. Specifically, they probed the fluorine atoms around the plutonium centers to measure the magnetic fields produced by plutonium (Pu4+), which revealed how the electrons were distributed in the sample. They determined that the plutonium and fluorine atoms aren't particularly generous. Both atoms tend to hold their electrons, acting more like ions in a salt where electrostatic forces hold the atoms together. 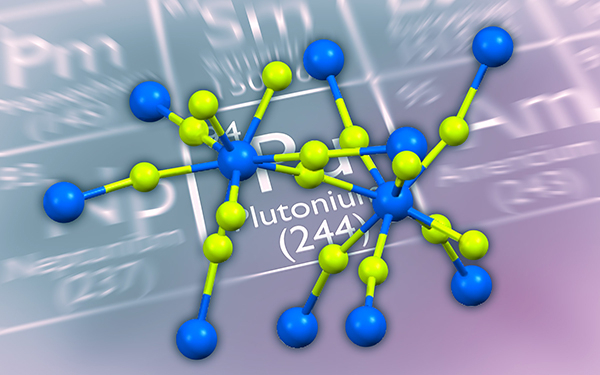 This research brings scientists closer to understanding the nuances of plutonium and other actinides, other radioactive elements near the bottom of the Periodic Table. What's Next? 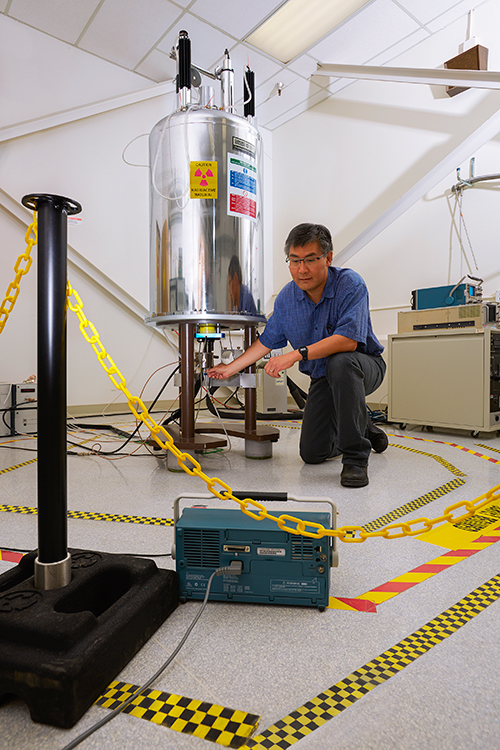 Cho and his colleagues are continuing to delve into the nuances of plutonium as well as uranium, neptunium, thorium, and similar complex actinides to understand how these elements interact with other atoms and groups of atoms. Sponsors: This work was supported in part by the U.S. Department of Energy (DOE), Office of Science, Office of Workforce Development for Teachers and Scientists (WDTS) under the Visiting Faculty Program (VFP) (CC, RJD) and the DOE Office of Science, Office of Basic Energy Sciences, Division of Chemical Sciences, Geosciences and Biosciences, Heavy Element Chemistry program (SS, BKM, and HC). Short summary: Extremely complex plutonium has ties to energy and security. Scientists from Pacific Northwest National Lab and Washington State University found that plutonium's behavior, in PuF4, can be attributed to the hoarding of electrons by the atoms.